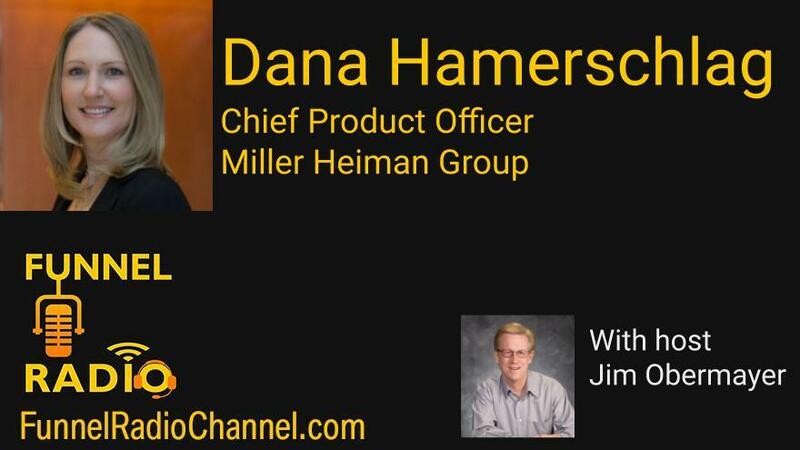 Dana Hamerschlag is the Chief Product Officer with Miller Heiman. In her role at Miller Heiman Group, Dana leads the global product organization and is driving the continued innovation of technology solutions. Dana brings more than 15 years of experience in technology companies backed by venture capital and private equity, where she has run product management, product marketing, strategy, and operations. Previously, she served as Vice President of Product Management at Ellucian, where she led the CRM business and significantly grew revenue from $0 to $38 million, paving the way for a $3.5 billion transaction. Dana spent the early part of her career at The Boston Consulting Group. Miller Heiman Group is the global leader in providing organizations sales methodology plus sales technology to drive revenue and change business outcomes. The company’s training, consulting, technology and research solutions align process, people, tools, data, and analytics to prepare sales and service organizations for the future of selling. For more information, visit www.millerheimangroup.com. Funnel Radio is hosted by James Obermayer and sponsored by the radio/podcast company the Funnel Media Group LLC. 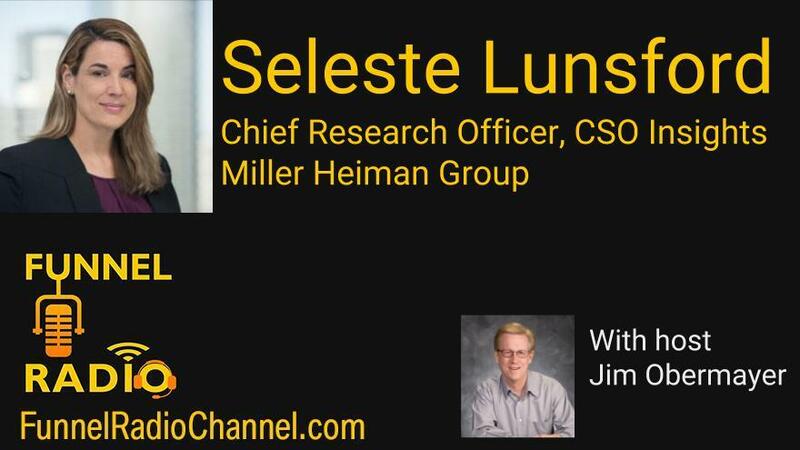 Seleste Lunsford, Chief Research Officer of CSO Insights discusses the surprising results of their latest Sales Performance study with Funnel Radio host Jim Obermayer. 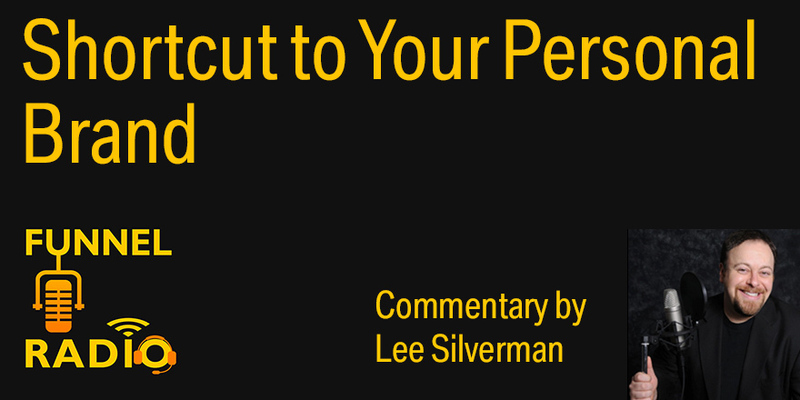 She talks about how the 900 companies in the study report that 95% are on their revenue plan and yet other parts of the report show some disturbing sales performance outcomes that show there could be trouble on the horizon. It appears companies are hiring more sales reps, but sales performance is down per rep; this means sales expenses are up and with any downturn there will be large problems. Selling in the Age of Ceaseless Change: 2018-2019 Sales Performance Study. Revenue Are up Sales Performance is Not. Roughly 900 global sales leaders were surveyed to identify the four main objectives underpinning their performance improvement efforts in the coming 12 months. These main objectives were improving lead generation, capturing new accounts, expanding penetration into existing customers, and increasing win rates. The purpose of this report is to show how sales organizations today are performing in terms of these objectives, how that compares to recent years and what successful companies are doing that’s working for improving sales performance. Seleste Lunsford has consulted with sales and service organizations for more than 20 years, helping them acquire, grow and retain client relationships. As Managing Director of CSO Insights, Seleste guides CSO Insights’ research focus areas and define its market deliverables. An experienced business leader, Seleste has led a range of consulting, product development, professional services and operations functions. She has co-authored two books, “Secrets of Top-Performing Salespeople” and “Strategies that Win Sales.” She’s also written articles on sales effectiveness found in Selling Power, Entrepreneur, Chief Learning Officer and PharmaVoice, as well as DestinationCRM.com and HR.com. She’s proud to have supported some of the world’s most recognized companies including AAA, Alliance Bernstein, American Express, Arrow Electronics, Citibank, Convergys, U.S. Department of Defense, Office Depot, Traveler’s Insurance and Verizon Wireless. Seleste earned both her bachelor’s degree and MBA from Florida State University. Is There an ROI for Sale Enablement? Ahh, the sweet promise of Sales Enablement. If only the right content could be created to support what salespeople really need to sell. If only sales training were more than product training. If only sales enablement enabled salespeople to be the best that they can be. If only the marketing and sales people could talk to each other to discuss sales enablement. If only sales enablement would benefit the prospect. Our guest this week, the Chief Readiness Officer at Brainshark says all of this is not only possible but when solved it brings a ROI that any CFO would be proud to claim. Find out about the three baskets of measurement that Jim and Brainshark say are not only possible, but expected when Sales Enablement is done right. 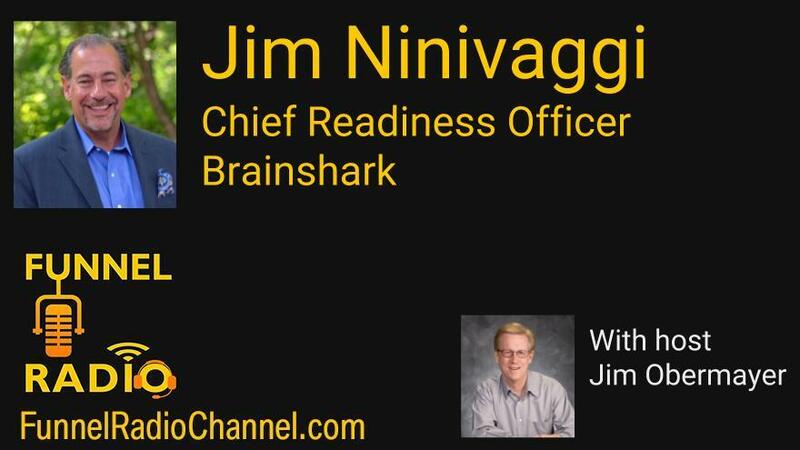 Leveraging more than 30 years of B2B sales productivity expertise, Jim leads Brainshark’s sales enablement and readiness strategy. 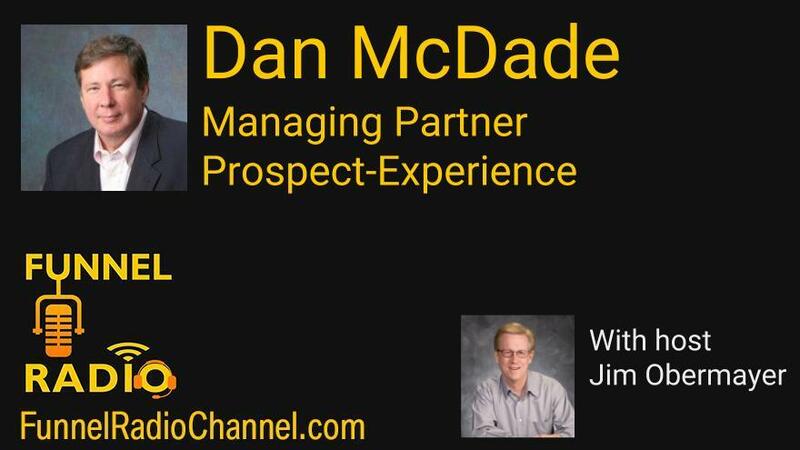 Jim previously worked as a sales enablement analyst with SiriusDecisions, where he provided clients with data, insight and thought leadership to maximize sales effectiveness and accelerate revenues. Today, he uses his knowledge and expertise to prepare the Brainshark sales force with the knowledge and skills to optimize every buyer interaction. For those with a long workout or miles to go before you sleep hike, listen to six programs on the Funnel Radio Channel. Click to hear all programs sequentially. Or click on the program links below to listen to individual 25 minute podcast replays of the live program. These are the Funnel Radio Channel Programs for November 29th, 2018. They are offered sequentially as broadcast. Quite a broadcast day for our 5th Thursday of the month. Patrick Morrissey and Mat Singer kick it off on Predictable Revenue Radio with the topic - Making Sales Enablement Work for 2,000 salespeople. Mari Anne Vanella welcomes Dan Sixsmith on Outstanding Outbound tackling What Sales Leadership is in Denial About. Insights from Leading SMB & CRM Pundit Gene Marks on CRM Radio with host, Paul Petersen. Matt's guest is Gillian Muessig, CEO & Co-Founder Outlines Venture Group @SEOmom Topic: B2B Start-up Sales Lessons, Mistakes & Best Practices. Kyla and John talk about Five Factors Creating Elite Sales Mindsets on Asher Sales Sense. WVU MarComm today closes out with host, Cyndi Greenglass and her guest, Larry Stultz talking about Ideation Techniques, Concept Development and Integrated Marketing Communications (IMC). Join us and listen live or catch replays from any of our shows. Podcasts break through social media and lead generation clutter by connecting with the audience in an authentic manner. Some say social media and podcasting are the new resume. 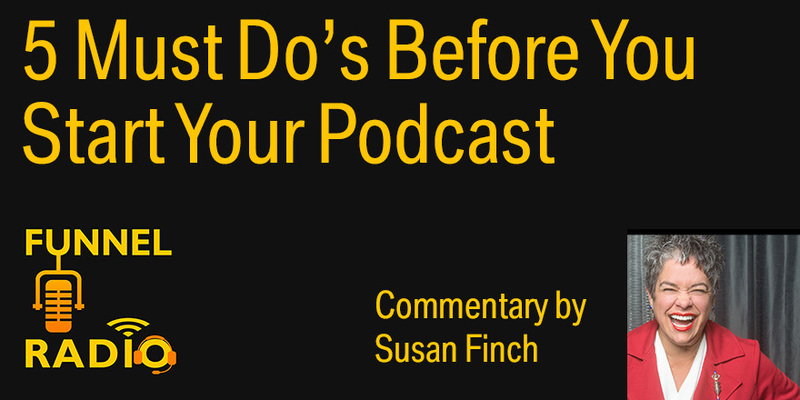 But before you jump in-front of a microphone and spend 2-4 hours of recording and editing, give some thought about what it takes to be a successful podcaster. For those new to podcasting, you probably may not realize it, but B2B podcasts from you and your company create multi-use content, testimonials, thought leadership, and relationships with industry leaders. Plus, podcasts create a personal brand for the host. Podcasts introduce you and your products to thousands of potential customers and those that refer customers, but there are five things you must have in mind to be a success. At the Funnel Media Group, publisher of the Funnel Radio Channel, after producing dozens of podcast programs with hundreds of thousands of listeners, we have found the following to be needed before you start your podcast. You must be consistent: To gain followers (listeners and subscribers) you must produce a show that they can follow with regularlity. Once a month programming is very good, twice a month for moderately sized companies provides more visibility and a following. Weekly programs published from large companies and marketing departments are better when they can use the enormous amount of content which comes from each podcast. Decide why you are doing a podcast. Decide what your goals are before you start. Podcasting is about building and conversing with an audience. And as Jason Calicanis once said, “Audience equals power.” Do you want to introduce yourself to movers and shakers in your industry by interviewing them? Do you want to build a personal brand? A podcast can create great testimonials for you and your company. Do you want to build a network of people that follow you? How about creating content for your marketing efforts such as ebooks, nurture content, case studies, blog entries? Some podcasters have hundreds of listeners and they are happy, some thousands per episode. Your show needs professionalism: Sound, host and announcer quality are important. Music introductions, transcripts, separate announcers and commercials add interest and entertainment value. A professionally produced podcast from an agency that specializes in podcast production can produce a podcast for the host and company including the storage site, studio, announcer, music, artwork, embeddable code, etc., for as little as $500 per episode. You do not have to have an announcer voice, but you do have to be interesting, don’t take yourself too seriously, and remember if you have a guest, it is about the guest. Content must be interesting: It is entertainment after all, don’t lose sight of this. Listeners want to learn in an entertaining way, it is expected. Entertainment has more to do with the guest and a tightly edited program than humor and sound effects. Each program’s title and its content must be stimulating and worth the time invested by the listener. Programs with “How-To” or similar titles are the most popular and long lasting. Using an industry personality’s name may help, but you have to use a giant name such as Marc Benioff in the title to benefit from it. The ideal show length: An ideal program length should be determined by how much time a listener will give you. An hour is too long (most producers will agree) because the listener has probably reached their destination, come in from walking the dog or run their training circuit. 22-30 minutes is ideal for the listener who listens on a mobile device away from work. Longer than that and your guests may also run out of things to talk about; keep it short and less boring. Hope is not a strategy. Use the content, don’t just record and post it and hope someone finds you. Your company can use the content many ways. Podcasts produce a plethora of content option such as testimonial quotes, blogs, nurture messages, ebooks, hard cover books, guest websites, white papers or case studies. It takes time to build a following and network, but once build, you’re golden: Whether it is your company name or your name, it takes more than a few episodes to build a following. At 6-12 episodes, people recognize the company and that you are hosting a regular podcast. With each succeeding show you gain listeners, followers and a reputation. Considering how little time you put into a podcast (22-30 minutes a show) it’s a good investment. How to Measure Podcast Contributions to Revenue. Guests are easy to get: Guests want the exposure as much as you do. 90-95% of the people you ask to be guests will agree. With over 500 executive interviews I can count on one hand the people that have turned us down, usually because of timing. Guest love to be heard, they feel honored that you ask. After all, it is all about them. Follow these tips and you too can join the podcast personalities that reach thousands of listeners with thought provoking guests. Today’s mobile listeners want business entertainment and training without the clutter of so many social media outlets. If you want to pitch an idea for a podcast on the Funnel Radio Channel, contact me Susan Finch, [email protected], and let’s talk. Having your own personal brand, beyond words on a resume or your company biography, makes sense, is required and expected. It could be a sales management job, marketing management (of course); even CEOs, CIOs, CFOs and presidents have personal brand considerations. When you consider creating your own personal brand, you’re investing in yourself and your future. These are the Funnel Radio Channel Programs for November 15th, 2018. They are offered sequentially as broadcast. These are the Funnel Radio Channel Programs for November 85th, 2018. They are offered sequentially as broadcast on November 8th. These are the Funnel Radio Channel Programs for November 1st 2018. The programs are offered to you in sequence.